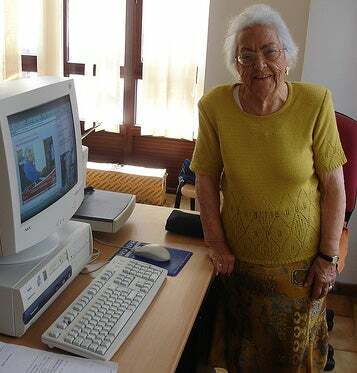 Maria Amelia Lopez, a Spanish great-grandmother who called herself "the world's oldest blogger," died today in her home at the age of 97, leaving more than 1.5 million readers from around the world mourning her passing. Lopez started blogging from her seaside home in Galicia, Spain, two and a half years ago on her 95th brithday, according to the Telegraph. "Today it's my birthday and my grandson, who is very stingy, gave me a blog," she wrote on December 23, 2006, in her first post on her Spanish-language blog, amis95.blogspot.com. She posted once a week and sometimes daily, and had to dictate to her grandson because cataracts impaired her vision. In the past few months she had been posting video messages instead of written posts. "It's like having a conversation, and those who read what I say become my friends," she told the International Herald Tribune in a 2007 profile. Elderly people like me - and there are a lot of old people who are younger than I am - should all have someone who shows them how to use the Internet... You have to stay informed. She even commented on fashion from time to time, writing in January that she wondered how girls in church stayed warm with "their little knickers showing and their hips all bare." But, she did like some modern fashions. "A miniskirt with a pretty pair of legs - that, I love," she wrote. "But you really need to have good legs." No one pays any attention to old women any more. Not many people love us. But I was surprised by the internet, because young people who were 18 years of age, or 14 or 15, tell me about their lives and what they think and ask my advice. In one of her final posts in February, she wrote: "When I'm on the internet, I forget about my illness. The distraction is good for you - being able to communicate with people. It wakes up the brain, and gives you great strength." CNN reports that her family left a final post on her blog, thanking readers for their support. Readers have already left more than 600 comments mourning the woman they affectionately called, "the blogging granny."